Images taken November 29th, 2009. Columbusites: Have you been spying all of these yellow leaved shrubs with bright red berries that are everywhere in our urban woodlands? Jim McCormac tells the story of one of our nastiest non-native invasive species, Amur Honeysuckle, right here. What are the local nasty invasive species in your part of the world? These make it look like it is winter- although on Sunday it surely didn't feel like winter. It is getting chilly this week though. 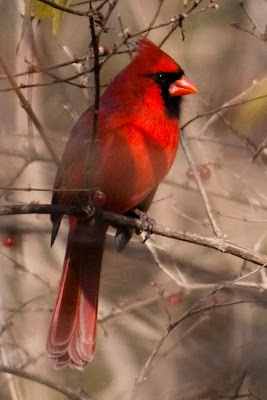 Beautiful cardinal. the robin looks skinny. But could global warming be helping the spread of invasive honeysuckles? Is Amur Honeysuckle generally a more southerly species? I haven't found it in Saratoga County NY, but we certainly have Tartarian Honeysuckle crowding out our local native honeysuckles. Plus lots more alien invaders: Phragmites, Multiflora Rose, Purple Loosestrife, Buckthorn, Burning Bush, Garlic Mustard, etc. etc. etc. 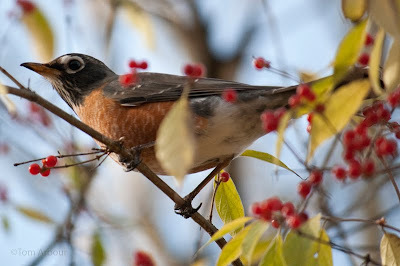 And we now have robins and bluebirds all winter long, way up here near the Adirondacks. I'm surprised how much bush honeysuckle I see in Metroparks, etc. I know its removal is a big job, but shouldn't it be priority? (I'll volunteer!) Also, on State of Ohio DAS property on Surface Rd, what I assume is Amur is growing all along the stream. In the natural preserve that I haunt, porcelainberry (Ampelopsis brevipedunculata) is the worst--but not the only--scourge. Porcelainberry is an Asian member of the grape family that was introduced as an ornamental (and it is attractive for two weeks when it sets fruit; birds love it and spread it around). But it is an extremely aggressive vine that acts like a grapevine on steroids. We call it the "kudzu of the North." I have seen similiar bushes with berries, I am not sure about it being Amur honeysuckle. Does it attract the birds? Great shots. Jackie- Amur honeysuckle is more common in southern Ohio, but I'm not sure why. Morrow honeysuckle is the nastier bush honeysuckle in NE Ohio, for example. Amur honeysuckle seems to do well on calcareous soils. Susannah- It is a huge job. Some parks are starting to tackle the problem, but many are so infested, it would take a huge effort remove invasive species. It's all about priorities, really. The best thing to do is to keep these species out of areas that currently don't have them. Hey Scott- We had a nice patch of Ampelopsis near our old home. The berries are really interestingly colored, sort of multicolored bluish and purplish. Eileen- Yes, the birds were devouring the berries. Amur, morrow's and tartarian are the common non-native bush honesuckles here in Ohio. Our biggest invasive problems here are Chinese tallow trees (which are virtually indestructible,) & nutria (swamp rats that are destroying the wetlands at an unfathomable rate.) Nutria aren't so much "in our faces," but Chinese tallow trees are even in our own yard. Thanks for stopping by and commenting about the Drobo. I have been aware of it for some time, but my experience and your mention of it is causing me to take a harder look at it. I actually thought that the original tapes were enough in the way of backup, but after being faced with all of the work of recapturing, something like this seems like a better option. In reference to your post today: Perhaps our most common problematic invasive species here ins Southcentral Pennsylvania are the multiflora rose and autumn olive. Both provide excellent food and cover for wildlife, but cause problems by spreading where they are not wanted. I also enjoyed the photos of the cardinal and robin. Well done!